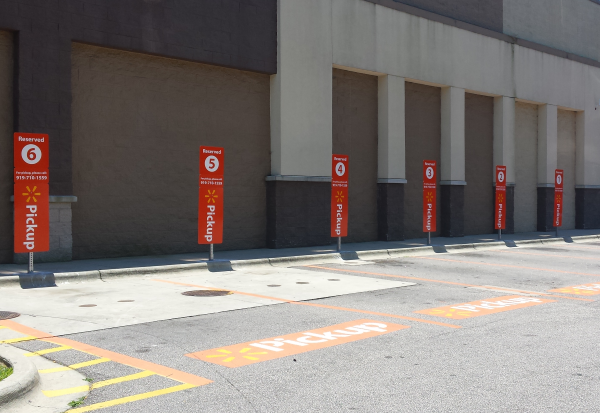 Walmart Grocery Pickup Service Will Change Your Life! I’ve used online grocery shopping pickup services off and on for quite a few years, for various reasons. I’m not sure why I was so stunned when I received a brochure in the mail announcing Walmart’s new online grocery shopping service. How had I not heard that this was coming?! Would it be worth using? I decided to give it a try to see how things went. Here’s a review of my experience using Walmart Grocery. 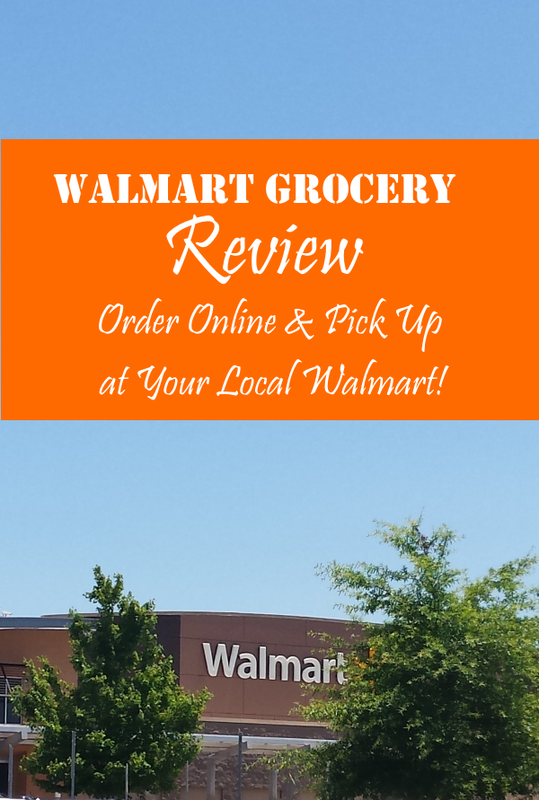 Here’s my review of my experience using Walmart Grocery. It’s positively life changing for me. Now I can get the absolute lowest grocery prices without having to fight crowds or wait in line. First, please note that Walmart Grocery service is not yet available in all locations. You’ll want to use the Walmart Grocery website to check availability at your local Walmart before selecting your groceries online. I’m fortunate that one of the available locations in my area happens to be at the Walmart closest to my house. 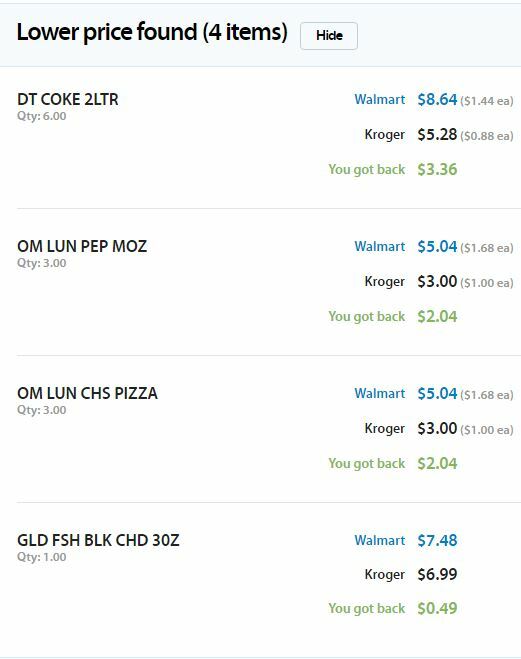 Online ordering through Walmart Grocery is similar to my experiences with other grocery stores. There’s a favorites list, and all of the items from my first order were added to it automatically. I’m not sure if all of the items from every order will auto-add to my favorites list. I hope not, since this would be a pain. There are some items I order on occasion but wouldn’t want cluttering up a list I’d use for frequently selected products. Walmart Grocery’s search engine is also more intuitive. For example, if I mistype “creamed spinach” as “cremed spinach” (without the quotes) on the grocery store site, it comes up with no results. Walmart’s site recognizes that I made a typo and brings up “creamed spinach” options. Walmart Grocery has one thing I’ve not seen before – the ability to select which items you allow substitutions for, using a simple checkbox. On the other hand, the store where I normally order groceries has a comment box where I can make note that I don’t want subs without authorization. A shopper calls me when my order is ready and asks whether certain subs are acceptable. Plus, they normally offer subs at the same price as the original item I’d asked for. For example, if they’re out of the Hormel bacon that’s on sale, they might offer Smithfield bacon at the same price. Walmart probably won’t have as many subs since they don’t tend to run out of items as often. Grocery stores generally run out of items that are on sale, and Walmart doesn’t run regular grocery ads. In my Walmart Grocery order, there was only one item they didn’t have in stock. They subbed another brand at the lower price of the item I’d requested, automatically. Walmart has everyone beat on the price of their service, since it’s free at this time. Most grocery stores in my area charge $4.95 or $5.95 per shop, or a monthly fee for unlimited shops of around $16.95, or $99.95 annually. Grocery stores sometimes run specials offering free shops – waiving the shopper fee – usually above a certain order amount (like $50 or $100) or in return for purchasing a certain item as part of the order. I’d say there’s an offer I can use to waive the shopper fee roughly once every month or two. Also, the store I use almost always offers some free item as a bonus for using online shopping, like the free Oreo Thins I received last time (priced at $3.50) along with a free yogurt (worth $1). The store also runs specials available only through online shopping. The free item(s) combined with special deals sometimes equal or exceed the value of the shopping fee, though the free items are often things I wouldn’t otherwise have bought. Let’s face it. Walmart is by far the cheapest place to buy groceries, at least in most cities. You’ll find some things that are better deals at grocery stores on sale – mainly buy one get one free or buy two, get three free deals. Here are some real, recent price comparisons using online shopping (which are the same prices you’d get shopping in the store on your own). These are for store brand items or the lowest price brand, unless otherwise noted. There are some brands that my family likes which Walmart doesn’t carry, such as Boar’s Head deli meats. 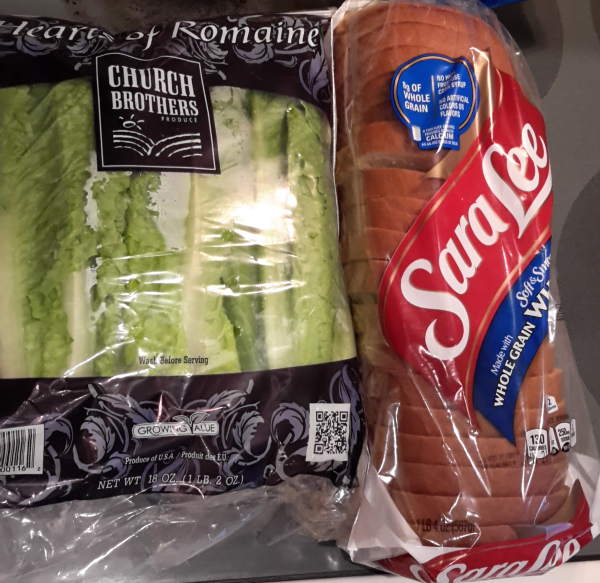 However, the strawberries, romaine lettuce and bagged salad were excellent. Their pre-made Angus Steak Patties hamburgers are absolutely delicious. The big drawback to Walmart Grocery is that they don’t accept manufacturer’s coupons as of this writing (I verified this with Walmart Customer Service). With other grocery store online shopping services, you can present your manufacturer’s coupons and have them deducted from your next order. Plus, the grocery stores I’ve used offer double coupons up to 99 cents (sometimes even better with super doubles up to $2, every couple of months or so). Want a $10 coupon for yourself? Click here to place your order with Walmart Grocery. 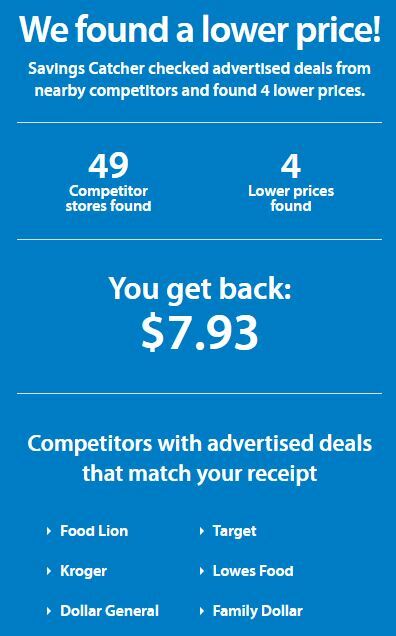 One of the cool things about shopping for groceries at Walmart is their SavingsCatcher program, which scours local grocery ads and automatically price matches. You simply enter a number from your receipt into the SavingsCatcher website. A few days later, you’ll get an email notifying you of how much you can get back toward a Walmart gift card, based on the price differences found between Walmart and other local grocery stores. The email you receive after you pick up your Walmart groceries should have a SavingsCatcher number in it, just like you’d normally find on a Walmart register receipt. Go to Walmart SavingCatcher online and enter that number along with the date of purchase, within 7 days. SavingsCatcher doesn’t work with BOGOs or similar offers (such as buy 2, get 3 free). There has to be an actual sale price in the grocery store ad to qualify for Walmart SavingsCatcher. 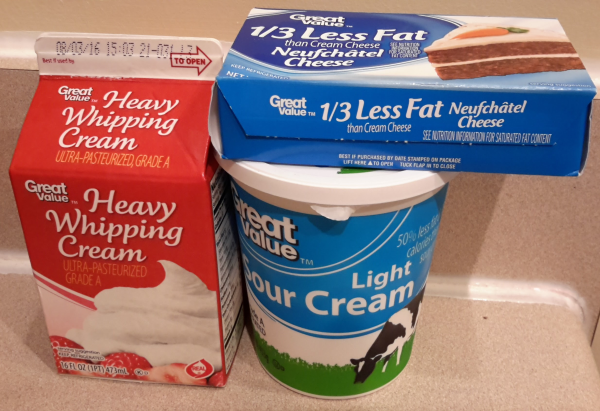 My shopping was performed accurately – I received all of the items with one substitution. The Walmart employee who called to let me know that my order was ready didn’t have anywhere near the same flexibility or authority as grocery store shoppers. She couldn’t do anything about the $10 off coupon that didn’t come off, directing me instead to Walmart Customer Service. There was no back and forth about anything such as substitutions or whatnot – just your order will be ready for pickup at your designated time, and I told her I’d be right there. 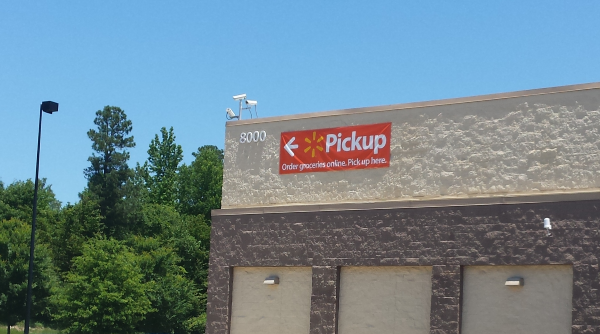 Besides prices, pickup is another area where Walmart Grocery really shines. For one thing, the grocery store I use most often offers fairly limited pickup hours, especially on Sunday, when pickups don’t start until noon. With Walmart, pickup times start at 8:00 a.m. every day. Also, the one thing I hate about online grocery shopping where I usually shop is their pickup lane. Only two cars can fit in the lane, so if there are two cars already there, I have to drive around a very busy parking lot, park somewhere, and come back later, hoping that there’s an open space. Once I get to the call button, I have to wait for someone to answer, wait for them to load up my groceries and bring them out, then pay using their rather slow mobile credit card reader, and wait for my groceries to be loaded into my vehicle. I never thought this was a particularly long process until I tried Walmart Grocery. Walmart doesn’t have a call button. They have big signs over their six parking spaces for grocery pickup showing the number to call for pickup. However, you can call 10 minutes before pickup for faster service. Since I told the woman who called me that I’d be there at 10:00, they must have been watching for me. I had almost finished dialing the phone number when someone came out and asked for my name. However, you can call 10 minutes before pickup for faster service. Since I told the woman who called me that I’d be there at 10:00, they must have been watching for me. I had almost finished dialing the phone number when someone came out and asked for my name. She returned in about 2 minutes, with another employee who loaded the groceries while I signed for the order on her mobile device. Walmart takes your credit card payment information when you place the order rather than at the store, so there was no need to swipe a card and wait for it to process. There was also no paperwork. The receipt was emailed to me shortly after my pickup. The Walmart I used for this shopping trip is about a 10-minute drive from my house. I left the house at about 9:50 a.m. and was back home by 10:20. That’s how little time this whole process took. Is Walmart Grocery Worth Trying? Obviously, Walmart isn’t doing online shopping as an afterthought. They might not have all the kinks worked out, but they have some big things going for them – mainly pricing and pickup speed. Walmart Grocery pickup service is available in more than 30 regions across the U.S., including where I live in Raleigh. If it’s available in your area, I recommend giving it a try. Walmart Grocery has a minimum order of $30 ($50 to use the first timer coupon). You’ll probably love the service if you dread going to Walmart because of the crowds and long checkout lines. Or, maybe you always end up spending too much because you or your kids keep throwing things into the cart that aren’t on your list. Have you tried an online grocery store shopping service? Do you plan to give Walmart Grocery a try? Update: I’ve now used Walmart Grocery several more times, and it’s fantastic. If it’s available in your area and you like getting the best prices on groceries, you should definitely give it a try.